Last week we attended a birthday party for a sweet little girl in my son's pre-school class. One perk of going to a pre-school where the mom's attend in a parents' room is that I've become friends with her mom...she's also a transplant, and is lovely. I figured as with all 4 year olds, there is very little they actually NEED...So I decided to make Maeve this adorable little doll. My take on a Black Apple doll, as shown on Martha Stewart (a very long time ago.) 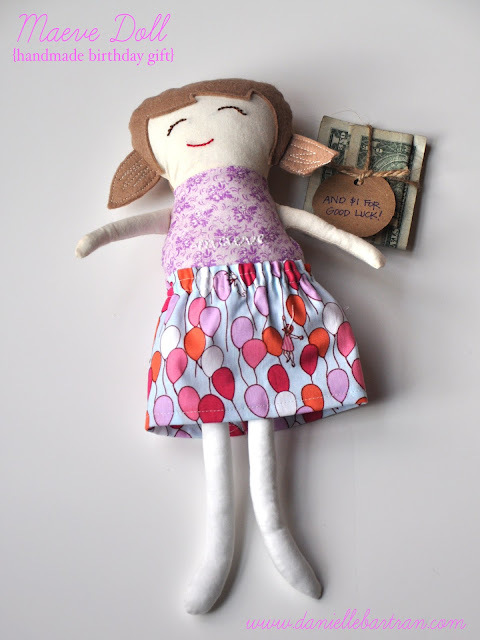 I've made a few of these dolls before, but this time I embroidered Maeve's name on the belly (in white, so it's difficult to see) as well as making a cute little skirt using some Sarah Jane fabric. I also folded up a $4+$1 for Good Luck for Little Maeve to carry. A sweet little gift for a sweet little girl! Also, in case you didn't notice: I've finally become a .com...yay! I've also linked to The Pity Party at 30 Handmade Days & Whatever Goes Wednesday at Someday Crafts.